Arabic Literature: Postmodern Perspectives introduces the work of twenty-nine pivotal authors from the Arab world writing in Arabic, English, French, and Hebrew. 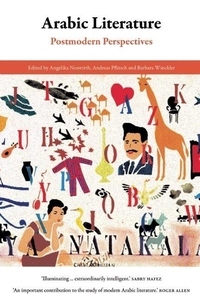 Organized around the central themes of memory, place, and gender, each of which is discussed in an introductory essay, the volume provides a critical framework for Arab writing, locating it alongside contemporary world literature. The contributors maintain that Arabic literature reflects the Western postmodern condition without denying its own traditions. As such, Arabic Literature paves the way for an important cultural dialogue between East and West. Authors covered include Adonis, Rabih Alameddine, Hoda Barakat, Tahar Ben Jelloun, Mahmoud Darwish, Assia Djebar, and Elias Khoury. Angelika Neuwirth is chair of Arabic studies at the Free University of Berlin. Andreas Pflitsch is a research fellow at the Center for Literary and Cultural Studies in Berlin and teaches Arabic studies at the University of Bamberg and the Free University of Berlin. Barbara Winckler is a research fellow at the Center for Literary and Cultural Studies in Berlin and teaches modern Arabic literature at the Free University of Berlin.